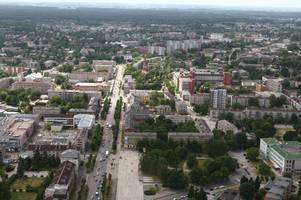 Jelgava is located in the central part of Latvia, the largest city of Zemgale planning region and, according to territory and population, ranks fourth among the cities in Latvia. Leading industries in Jelgava are food processing, textiles production, metal-working, machinery building and wood-working industries. Most of the active businesses in Jelgava are engaged with trade. The target area is situated in the city centre of Jelgava and is a mixed type residential and business buildings area. It consist beside shops and public buildings a number of multi-storey residential buildings. After World War II 90% of buildings in Jelgava were destroyed. The reconstruction started in the central part of the target area in the late 1940ies to the 60ies with mostly indi-vidual planned buildings in the common Soviet-style of this time. In the 1970-80ies the area was com-pleted with standardized multy-story apartment buildings. Also located in the target area are some important cultural historic heritage sites as like the museum Academia Petrina and the Tower of St. Trinity Church. Great part of the territory is under protection as historical site of national importance. With around 20.630 inhabi-tants approximately one third of the total population of Jelgava is living in the target area. The neighbourhood is well connected to the public transport network and contains retail, public services and cultural institution. Furthermore the area is well equipped with public and green spaces as well as with educational and health institutions. The major part of the area is connected to the central heating system. The former pipeline-system from the Soviet period was mostly replaced and two co-generating power stations provide heat and feat-in into the electric power grid. Both power stations were re-developed to a modern stan-dard of cogeneration on the basis of natural gas with the option in both systems for a future instalment of biomass as the basis of energy production. The technical conditions of the main structures of buildings in the neighbourhood are relatively good. On own initiative of the residents especially windows were replaced to avoid heat losses. However, insulation and the internal utilities remain rather poor. As the main challenge for the further development of the neighbourhood the munici-pality identified the energy related modernization of the building stock and the enhancement of the living environment. With the integrated urban development concept (IUDC) the city government of Jelgava develops a comprehensive stra-tegy for the enhance-ment of the neigh-bourhood. 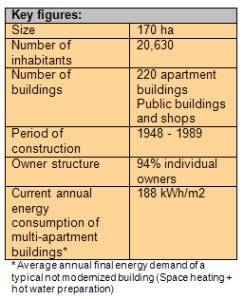 The major emphasis of the upgrading activities lays on the rise of the energy efficiency of the multi-storey residential buildings within the area. Parallel, approaches are developed to improve the amenity values of the yards of the multi-storey buildings, the development of modern recreation areas and play grounds as well as the modernization of parking lots and access roads. After the approval of the IUDC by the city council, prioritized activities will be integrated into the municipal Investment Plan. The city supports the refurbishment of the buildings by providing sample energy audits to for the most common building types to the owner associations. To promote the idea of energy efficiency, the municipality provides trainings for house managers and organize regular information activities for flat owners and general public.